That’s not where it hurts, the pain is here! “Why is this man faffing around with my back, it’s the knee that hurts” you may ask yourself. Well, there is a phenomenon called referred pain, which means that the pain is often not exactly where the problem is. Pain is a neural issue, it is generated in the brain. The location of pain is associated with the nerve that supplies the affected tissue. In the musculoskeletal system, it is quite common though that pain is not felt in exactly the spot where the problem lies. In the trapezius muscle for example, a problem on top of the shoulder may cause pain in the neck or even around your temple. But pain is only referred to areas that are supplied by the same nerve, in the above case the same nerves that supply the trapezius muscle handle sensory areas on the side of the head. It is not completely understood how this comes about, it seems that the brain a kind misinterprets the source of the pain impulses. The brain does not distinguish between pain originating from organs and pain from more superficial regions such as muscles or skin, it interprets both as superficial pain. Examples of this kind of referred pain are the pain in the left arm during a heart attack or shoulder pain with liver problems. 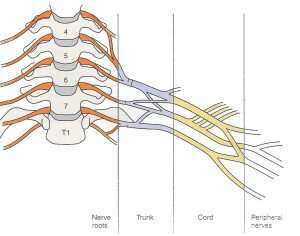 In anatomy, nerves become individual nerves once they branch off the spinal cord. Nerves outside the spine are covered by some sort of protective tissue, only near the spine there is a small area (nerve root) where this is not the case. And this is where nerves are most vulnerable to environmental influences, such as pressure, stress, or toxins. Damage to a nerve at this level can negatively affect any tissue that is supplied by this nerve, this can be as far away as your toe. This explains why chiropractors concentrate on the spine, their aim is to remove occurrences that negatively influence particular nerves.